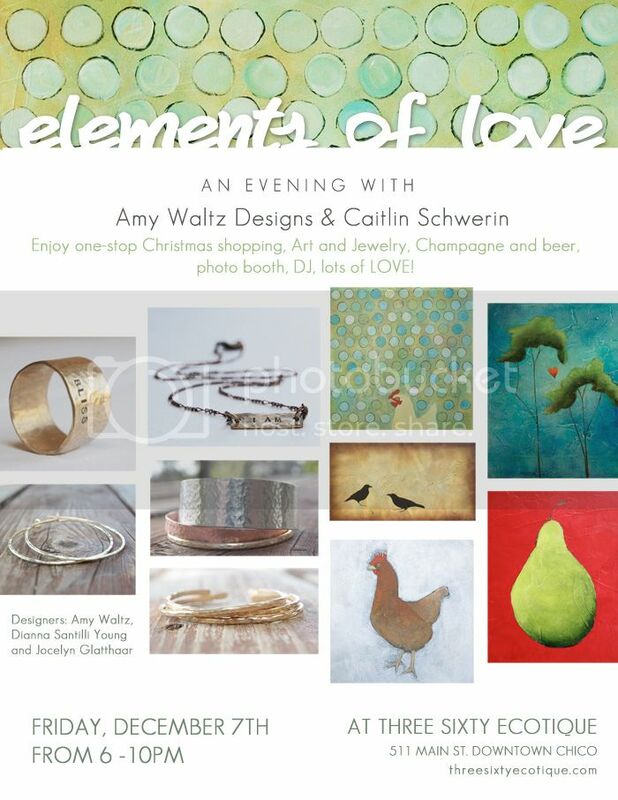 Caitlin Schwerin - blog: Events, Receptions, Benefits...Mark Your Calendar! blog: Events, Receptions, Benefits...Mark Your Calendar! I have an art show I've been working on all summer, and still no new website. Come see my work in person! August 12th from 11 - 5pm. Last time was so much fun, I'm doing it again! It's been many many years since I've had a show in my home. It's always been my favorite way to show and sell my work. I get to talk to people in the comfort of my surroundings, everything I need is at my fingertips, my house and studio are sure to be clean....it's a special time. I'm already preparing, and, I'm giddy about it! This week I'm finishing up paintings for a show at Satori Hair Salon - a beautiful building with huge white walls and awesome hooks and lines to hang the work. Skylights and lots of space. I'm excited about it as well! Work (will be photographed this time and will go up on this site) will be there to see for the month of February. I'm also showing through February at The Red Tavern! Go treat yourself to a brunch and some bocce, or dinner and some bocce. Let's not forget Monk's Wine Lounge. I put up some more new work there to keep it fresh and there are some lovelies just waiting to be seen over there. 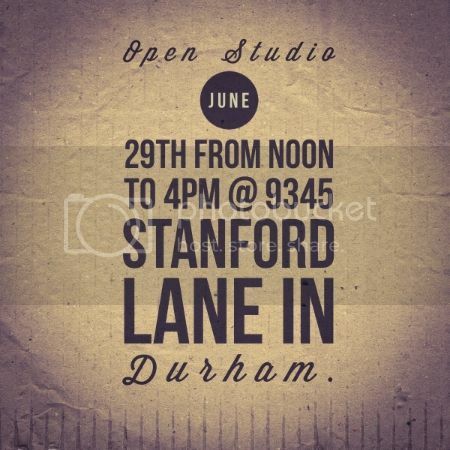 All these places are in Chico - my Open Studio will be in Durham. I'm back to work, and I wish you all a wonderful day! There is indeed, a flurry of activity happening in my studio right now. I am painting on hollow doors, trying to paint loose, but somehow still using my ruler for horizon lines, attempting to draw with my left hand some; to have my concentration be on lines instead of the big picture. I'm using new "toys" (materials) that are adding a new look and feel, which is thrilling, and the new additions are National Geographic pictures that have been treated to look splotchy and painterly and mesmerizing. It's fun to have something to mix up my style. The paintings are big, and my studio seems dwarfed by their stature. I can't wait to see them when they are all done. ...And get them on the gallery walls so that I can walk freely through my studio again. I am, however, trying to enact The Pomodoro Technique and commit to 25-minute intervals of energy put into the very important details that are not painting. So, Hello! I've also got new work slated to hit Monk's sometime in December...AND, I might be working on a local mural come the new year; but that is still in talks. I'm an incredibly busy girl and happy to be so. Cheers! My 25 minutes is up! If you haven't been to Auburn - you should try to make a trip. 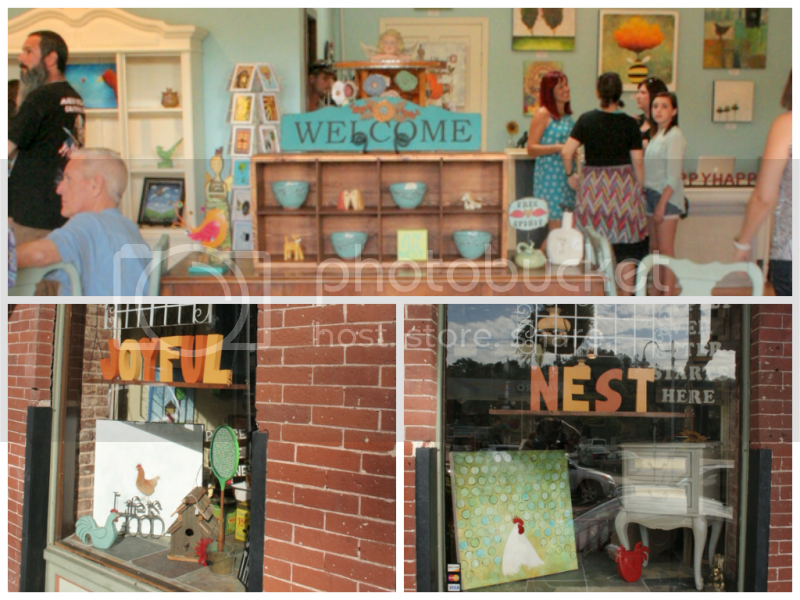 Old Town is as darling as it gets, and Tatiana Allen just opened the doors to her new shop Joyful Nest this past weekend. Local Artists from Northern California adorn the walls and shelves of this darling gallery. MY art was chosen to be there and I couldn't be happier! Great environment, a friend reaching up for the stars and following her dreams, magical gifts for house and home, and a really cute town to boot! Win, win, win! I'll let you all know when the grand opening is, but it is open for business now! 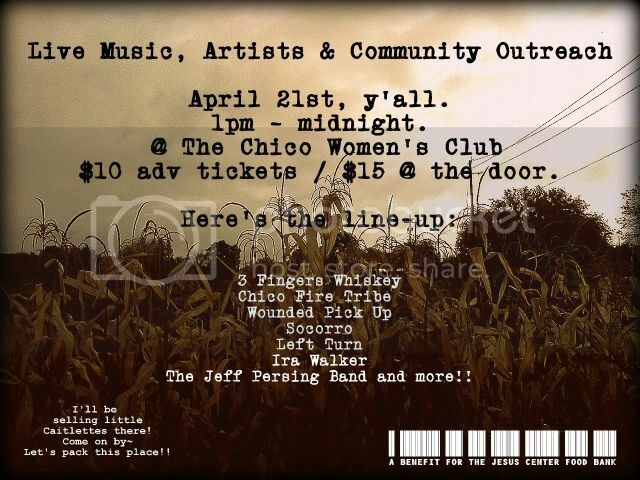 One Day Festival to Help The Jesus Center! Thank you all for coming to Beatnik's for my Art Reception!!! It was a beautiful day; All day. Right up until my smiling face hit the pillow. The show will be up until the end of April! My first art reception in a long while will happen at Beatnik's Cafe and Breakfast House on E 8th Street in Chico on Wednesday March 13th from 5pm - 7pm. Got a bunch of pieces up there now, hope to have more pieces by the reception. A big thank you to Michelle Camy who photographed my paintings! What a great feeling it is to be able to post some recent work! And the colors and contrasts are so great! I'm super stoked. 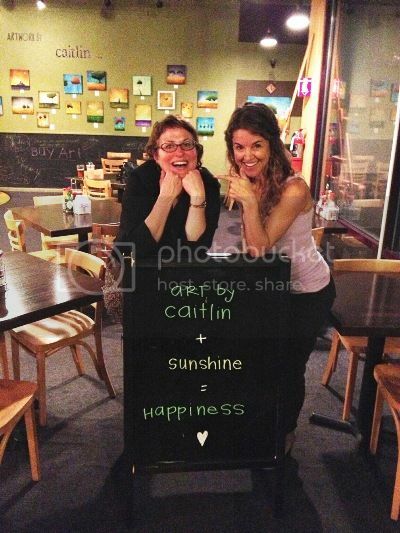 I thought I might extend the invitation to like my Artwork by Caitlin Facebook page. I update and have real time shows pretty often and most of the paintings are pieces that usually don't make it onto my website. Like my page for added insight and new artwork releases - Here is the link: Artwork by Caitlin. 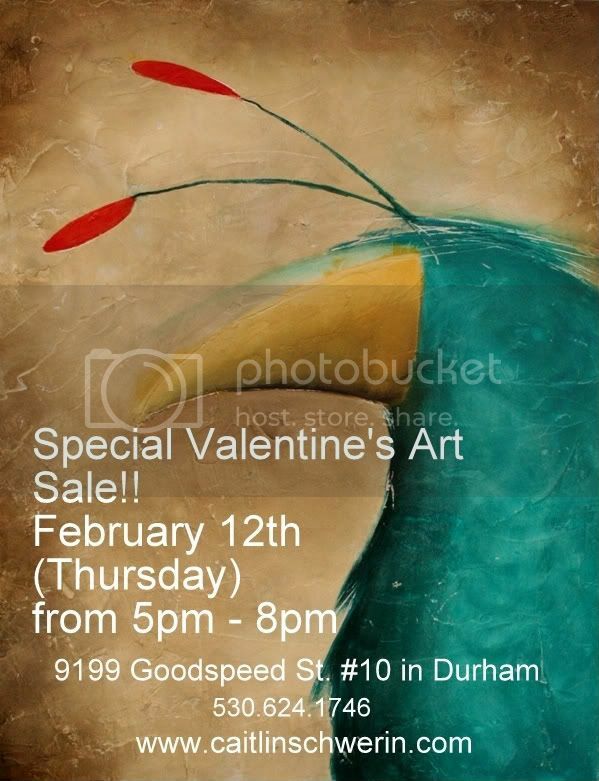 In fact, there will be a sneak peak / online sale of brand new work THIS THURSDAY, Feb 21st! Greetings from Durham, California - where the mosquitoes are as big as Dachshunds, there is always a tractor in front or behind you, and orchards as far as the eye can see. Well, it's September already, and I'm busy in the studio making new work for "Artober" here in Chico. A major art month. I've got quite a few shows coming up, so I thought it would be smart to let everyone know when and where they are! Monk's Wine Lounge: This Friday the 14th, join me @ Monk's for the Art Hop from 5 8pm! Cafe Flo: Art Reception on Wednesday the 19th from 5:30 - 7:30pm. Located @ 365 6th Street in Chico, CA. My new series of Chickens will be making their first appearance in the windows and interior of Kirk's Jewelry which is located at 246 West 3rd Street in Chico. New artwork will be on display at Monk's Wine Lounge - TBA ...all I know is that it will be new. Be sure to make the Sierra Oro Farm Trail where I will be making an appearance at Gale Vineyards with my artwork...most likely with a glass of wine in one hand and the other extended out to greet you! I know. It's been a while since I updated my website, but I'm on it! I've got a few new pieces up, and you can expect a whole lot more in the upcoming weeks. June 8th. Get ready for some brand new material. This is a darling baby sloth. This is a darling new painting that I did. J & J Cellars located at 1495 Hwy 99 Ste C, Gridley, CA 95948. Open Studio for the Holidays! If you are in Chico, you like my work and would like to see much much more of it in an intimate setting - join me this Saturday, December 17th from 11am - 2pm. Email me for address details: caitlinschwerin@yahoo.com. Friday, May 13th at 11am. Cafe au Play Meet and Greet! Come join me on Friday, May 13th at 11am for a Moment to Meet the Artist whose work has been showing at Café au Play these past few months. Her name is Caitlin, she likes to paint, and she would love to meet you! 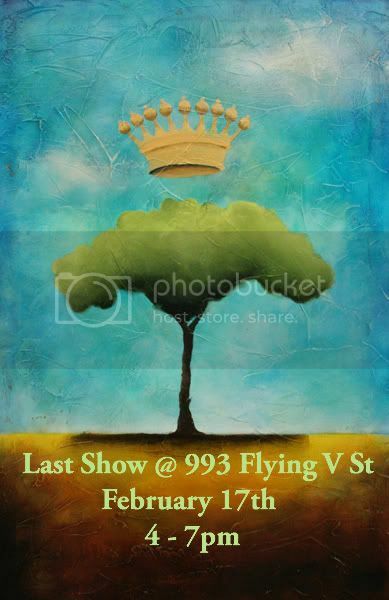 This will be a closing reception, as another artist is being summoned to adorn the walls and keep the variety alive! If there is a painting you have been admiring, dreaming of, pining for – but due to taxes, the economy, your children - you just can’t afford it, I welcome payment plans and I’m also approachable if there is a more feasible price you would like to discuss. Art Reception in CHICO! May 7th at Monk's Wine Lounge & Bistro!!!! Today is a beautiful day - the sun is out, the taxes are done, the birds are chirping and I am working on some magnificent new paintings for my upcoming show at Monk's in Chico. 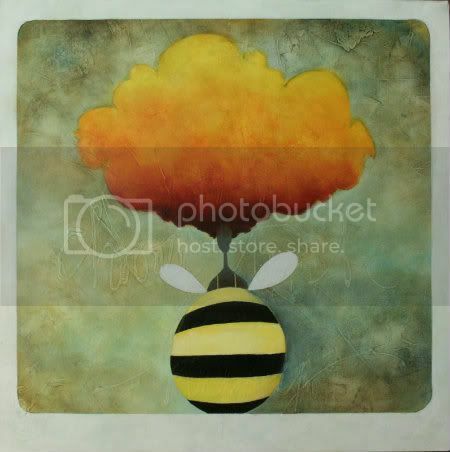 There will be big ones - big enough to fill that space that's always needed that certain something, and medium ones for just a splash of color and sentiment to fill your homes. I am also going to make small little pieces called Caitlettes - which I'll be selling from a bin, in the Lounge, that you can take home with you that very night! Plus - Music from Mood: Swing - a beat that will make toes tap, your hips sway, and your finger snap. Pam and Robert, I can't wait!! The show will be up for the summer - I believe I'll be taking the show down in August, but May 7th from 7pm - 9pm (although I'll be there earlier to see anyone who feels like having a glass of wine and a look-see with me) a Big Art Event and a Good Time is taking place. I'll be sending out information via email this week and please, spread the word! Life moves so FAST..before you know it, life is like that bus from Speed and you can't hit the brakes. Every once in a while, an event comes around to remind us of where we are and what is all around us. I am talking about the Portland Love Show. Gaggles of cool people milling around, admiring artwork from other cool people who are also milling around, all partaking of the potluck goodness everyone has provided for each other and sipping on spirits of the great Ninkasi. Doesn't that sound like fun? Well, my bus doesn't stop that often, but I participated in this group show, my very FIRST time in a group show since I moved to Portland. It's not often I make the time to sit back and enjoy a show, let alone one that I'm in!! I am showing in Hood River at Brian's Pourhouse, Hunt & Gather in the Pearl, just recently put up my work at Tin Shed on Alberta, and this is a very informal invitation to attend this --> Portland Love Show which is on February 12th from 7pm - 12am. Bring canned food for donations, your pocketbook, and hugs! January 2010 - "Woman with stuff on her mind and other things." In Hood River at the Double Mountain Brewery. Show is up for the month of January. See rest of blog for some sneak peeks! Show has been extended until the end of February!!! March 4th 2010, from 6pm - 9pm. - Sip & Kranz in downtown Portland. Come see me and my new work (so new I haven't made it yet) for FIRST THURSDAY IN THE PEARL!! May 2010: I return to Chico, CA for a show at The Artistry! Last Thursday Art Walk on Alberta Street! My luck has followed me to this beautiful city. Taking a leisurely walk down the colorful street of NE Alberta, I popped into a wonderful store called Real Deals Home Decor. I spoke with the owner, Holly - almost unable to reign in my excitement about being here. We got to talking, and before you know it - she invited me to be the artist of the month in September for the Last Thursday Art Walk!!! I am so stoked and am preparing as I write this. Birds. Trees. Landscapes. Words. Positivity. Monk's invited me to put up a show this Saturday. It will be a melange of past and present until I get the presents all put together. I will keep you posted as to when the reception is. Also, I have an interview with the CNR about working as an artist. I'll give out an update as soon as I have one! It's Artober here in Chico, and the open studios tour is upon us! My studio will be open this weekend, Saturday and Sunday from 10 - 5pm and the first weekend in November, same hours. The art reception, where you can see all the artists' work that are listed in the tour, is this Friday, from 7 - 9pm at the Chico Art Center. First Art Show in my New Place! * Old fashioned fun, pony rides, petting zoo, kid tractors and horseshoe games and sack races. * Bread Baking with freshly harvested milled wheat. It doesn't get any fresher. You watched it harvested! * Eat at the Food Court with Feminos of Blue Gum fame cooking. Serving 11am to 3pm. * Live old time music all day long. * Farmers Market. Select Vendors from Chico's popular Saturday morning Farmers Market. Parking and Entry to the Ranch is only $5 per person with 12 and under Free! June 14th - Saturday - A solo exhibition at Vino 100 in Chico. Located at 704 Mangrove Ave.
Wine tasting is only $5, but you don't have to taste to check out my new work. Reception starts at 4:30 and ends around 7pm. Over 100 local artists participate in this every year. The good folk over at the 24-hr Drive by Gallery cut up plywood into puzzle pieces, we all paint whatever we want on our piece, and then they display them - all put back together, in a silent auction extravaganza! Saturday, May 17th. I'm pretty sure it starts at 6. 117 W. 7th Street in Chico. Last Art Show at this location! 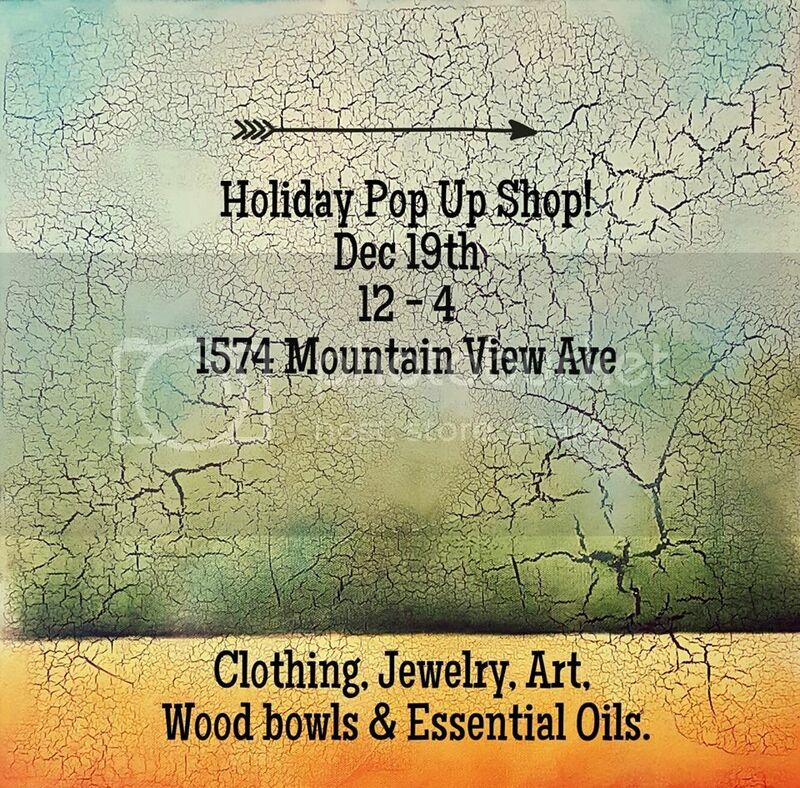 Holiday Art Show December 9th! I will be having a holiday show at my studio this Sunday from 10am - 6pm. Hopefully I will have a few other artists on display as well as my own. Any questions? Please write me at: caitlinschwerin@yahoo.com. I'm hoping to get the email out by tomorrow - and if anyone would like to be on my mailing list - please send me a message and I will include you in this and future notifications. The Open Studios (for me) is the first weekend only - October 6th & 7th from 10am - 5pm. It's held here at my house. ALSO coming up, is my solo show at The Black Crow. That series goes up on October 17th. The show comes down January 17th. As far as I know it's a three month show. If it is shorter, I'll post it. Anyhow. I'm excited, once again...but differently with my new art. It's taking different forms and functions. 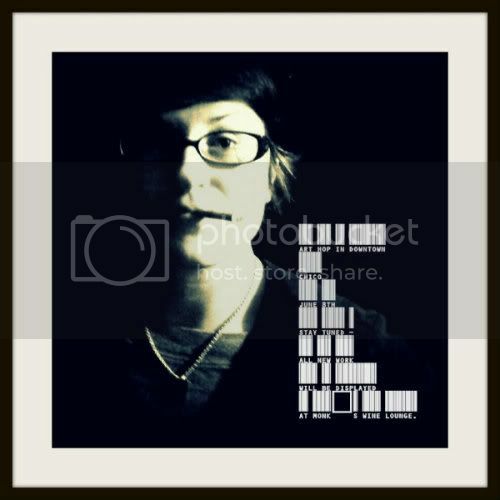 September 1st, 2007: "Meet and Greet the Artist" - with new series of hearts and crowns. 12pm - 4pm @ Savannah James.236 Broadway St. in Chico, CA. October 5th, 2007: Art for AIDS Auction. 5:30pm - 9:30pm @ Bonhams & Butterfields, 220 San Bruno Avenue @ 15th Street. This is a juried art auction of modern and contemporary art benefiting the UCSF AIDS Health Project. October 6th & 7th: 10am - 6pm. Open Studios Tour. October 18th - January 18th: Solo Show at The Black Crow . Come to my studio, August 4th 2007, for the First Saturday of the Month Art Walk. Open from 4pm - 8pm. Fantastic new pieces!! Some will probably even still be tacky! ....cause that's how I roll. Any questions? Email me @ caitlinschwerin@yahoo.com. Thanks and I'll see you here. I will also be having an art reception at Cafe Coda on May 17th from 6 - 9pm. This is a fantastic new restaurant in Chico that you should all check out. I'm planning a late afternoon art extravaganza on May 12th, 2007. Mark your calendars and anticipate more information in the coming weeks! I'm pretty stoked about this. I'm painting furniture, canvas, board, wall signs and paper pieces. 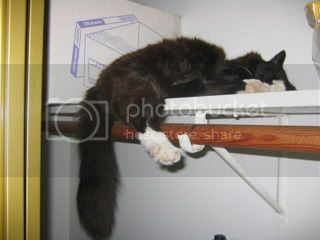 My cat Monkey is hard at work making sure I keep busy in the studio. "Have a glass of wine and chat with the artist" Night in Napa! I will be down in Napa on March 31st @ Stave Wine Lounge from 4pm - 8pm for a meet the artist night. The show consists of the pieces in my new work gallery on this site. Hope to see you there! Been working on a new series, set to be displayed on the 17th of February at Stave Wine Lounge. I'm really excited about the work as well as being thrilled to show in the beautiful town of Napa, California! Get ready for some delicious wine and some tasty artwork! Art Reception and Solo Show! I'm working on a new show for a wine tasting location in NAPA, CA. Looks like it will be the second weekend of February 2007. I will keep you posted with emails (if you are on my list - if you are not, please email me to add you) and postcards when I get them. I've joined the First Saturday Artwalk here in Chico - as a gallery (!!) and...it is THIS weekend. I've been so busy painting to get ready, I've neglected to mention it. It will happen every first Saturday of each month, and the event lasts from 4pm - 8pm. Be sure to take a gander at the Chico News and Review for a map of where the artists and galleries are located. I'm so excited! Hope to see you there, and I really hope to update my website before the show. Once again, we are quickly approaching that magical time where local artists start picking up after themselves and buy wine and cheese for others besides themselves...yes. It's Artober, and for the first and second weekends of October, the studios of more than 100 Chico Artists are open to the public. It's festive, it's intimate, it's exciting and everyone leaves with a greater understanding of artwork, of particular artmakers, or of the mediums we use to make what we do....OR they leave with paintings! 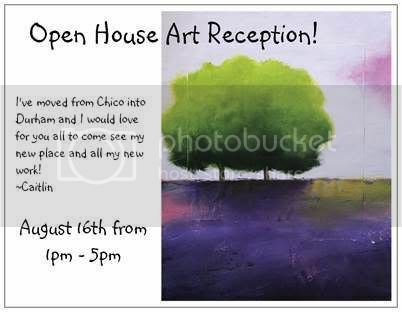 The Art Reception is at the Chico Art Center from 6-9pm on October 6th. For information on that, go to www.chicoartcenter.com. Look forward to seeing you here! Email me for more information, or just because! I will be having an art reception / silent auction at Monk's Bistro Wine Lounge, 128 West 2nd Street in Chico on March 2nd. All new work - a beautiful venue - and great wine! March 18th and 19th I will have a booth at the Silver Dollar Fairgrounds for the Home and Gardens Show. 10 - 5pm - I hve no idea what I will have to sell, but they will be small. I'll be located between the musical stage and the wine tent. Awesome! October8th & 9th and October 15th - 16th from 10am - 5pm. Come see my studio and all its nooks and crannies filled with new work!